Attention to detail is important for our homes on both the inside and the outside. This home is a lesson in how carefully considered landscaping can complement beautiful architecture. The home in question has a traditional exterior. 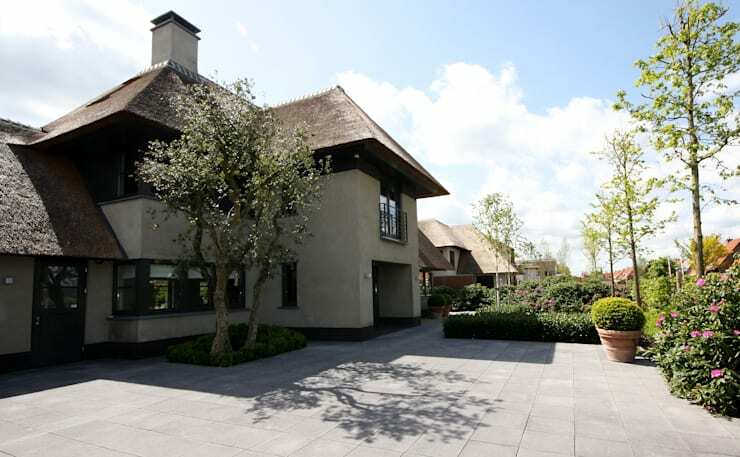 A peaked thatched roof, gables, dormers, chunky tall chimneys create a classic country look. An equal amount of effort has gone into the grounds around the home as went into the home itself. The gardens are arranged in a series of rooms, each with their own style, function and character. They augment the living area as well as the style of the home. From the rear, the full beauty of the buildings and gardens are on display. Large glass doors on the back of the house open onto the stone patio, connecting the interior and exterior. The patio continues around the perimeter of the yard, forming a generous pathway and framing the manicured lawn. While this room is all about the lawn, the designers broke up the expanse of grass with three beds of ornamental plants and shrubs. 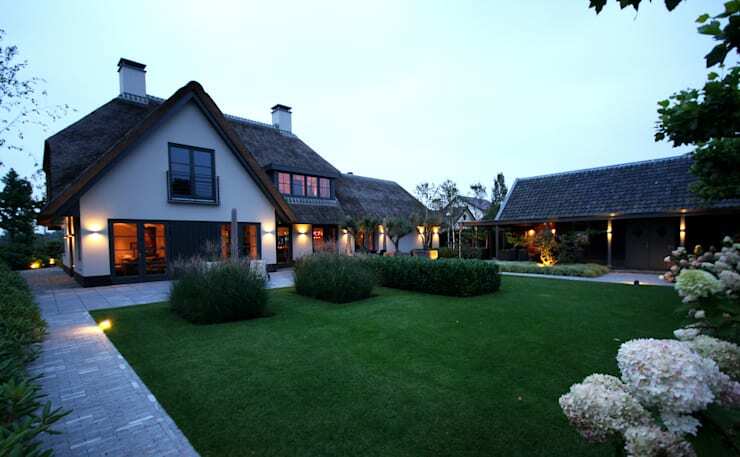 Lighting strategically placed on the house and throughout the yard enhances the atmosphere. The front of the house is all about the hardscaping. Square stone tiles form a large driveway and walkway. Most of the plants are grouped around the border of the drive and serve to soften the hard surfaces and straight lines. The rounded forms of a large single pot and a meticulously pruned topiary also contrast with the straight edges of the house and pavers. Close to the house, a pair of trees is planted in a small garden bed set within the tiles and bordered by a low hedge. Our next room is one of the most secluded spots in the garden. Set in a private alcove bordered by the main house, guest house and a tall hedge, this room has several distinctive features. 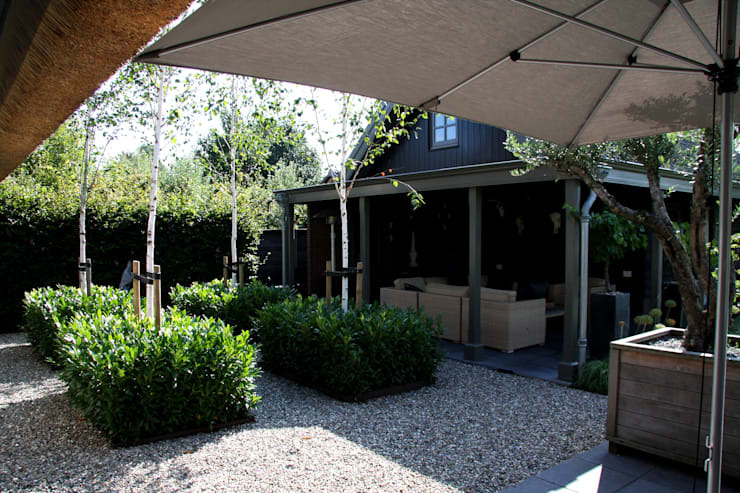 A simple gravel terrace holds four more island gardens, echoing those featured elsewhere on the property. Four young birch trees are set each in their own plot. Lush green shrubs cluster around the base of each tree. Beyond the terrace, a sheltered seating area sits under the guest house's generous overhang. Couches, planters and heaters make this a true outdoor living room. At the edge of the manicured lawn, gorgeous hydrangeas bloom prolifically. Small carefully pruned trees sprout from the verdant hedge. The luxurious bushes serve two functions. One, they act as a wall for the back lawn, separating this room from the one beyond. Second, they draw people's attention, encouraging them to cross the grass and gaze upon the canal. The final room is on the shore of the canal itself. The property comes with its own private wharf. 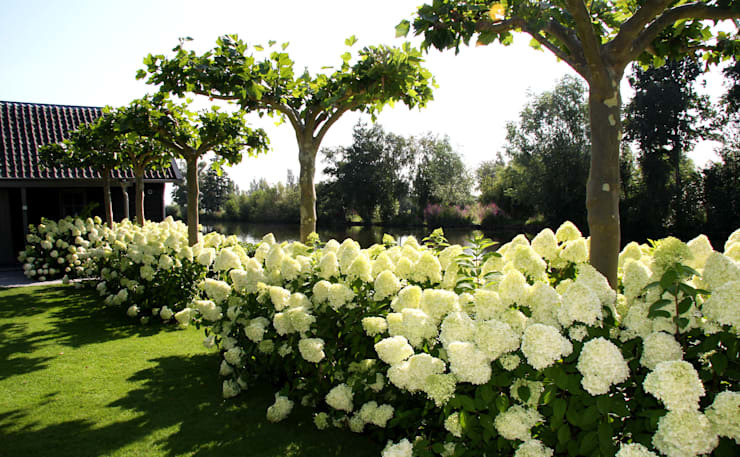 On the backside of the hydrangeas, a carefully trimmed hedge is the backdrop for a wooden dock. 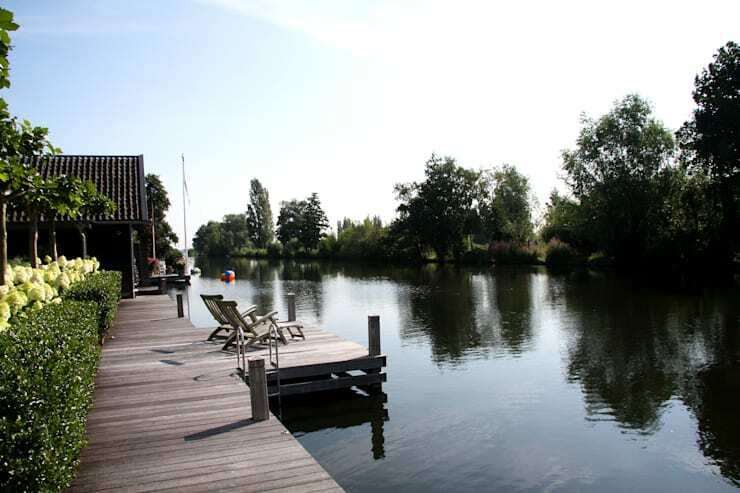 A wooden promontory juts slightly out into the canal, providing space for lounging by the water in a couple of chairs. This jetty, surrounded on three sides by water, is almost an island, connecting loungers to the water as closely as possible. What's your favourite room in this garden? Are you a patio person, or do you prefer the waterfront deck? Are you a fan of hydrangeas?